Each winter, the University of Miami English Department, in conjunction with the Mangrove Journal, hold the Isaac Bashevis Singer Prize in Fiction, the Laurence Donovan Prize in Poetry, and the Mangrove Cover Art Contest. 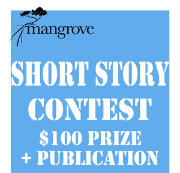 The winner for each genre will be published in Mangrove and receive a $100 prize. All entries will also be considered for publication. Students should submit work by e-mail with their name, phone number, address, graduation year, and preferred e-mail address on the first page of an MS Word document, with the piece(s) them- selves following after a page break, including the title but no other identifying information. Up to 5 poems and 2 pieces of prose. Prose pieces should be no more than 15 double-spaced pages; poetry submissions should not total more than 10 single-spaced pages. One $100 prize will be awarded in each genre. We cannot consider submissions that do not follow these guidelines. 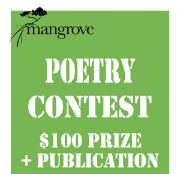 Entries should be submitted to mangrovejournal@gmail.com with "Contest Submission" in the subject line.